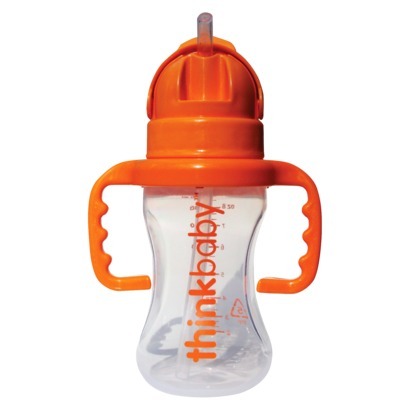 Thinkbaby makes wonderful products for children and families, including a line of baby bottles, sippy cups, and straw sippys. In addition to their cups, thinkbaby also has a line of natural and safe sunscreens for babies and sport lovers. We have really enjoyed having both the Thinkster No Spill Straw Bottle and the LIVESTRONG natural sunscreen in our home. Read on for the full thinkbaby thinkster review and the LIVESTRONG Sunscreen Review. You can also enter to win a thinkster cup and Livestrong sunscreen now through 11/15/12 here at Why We Love Green! 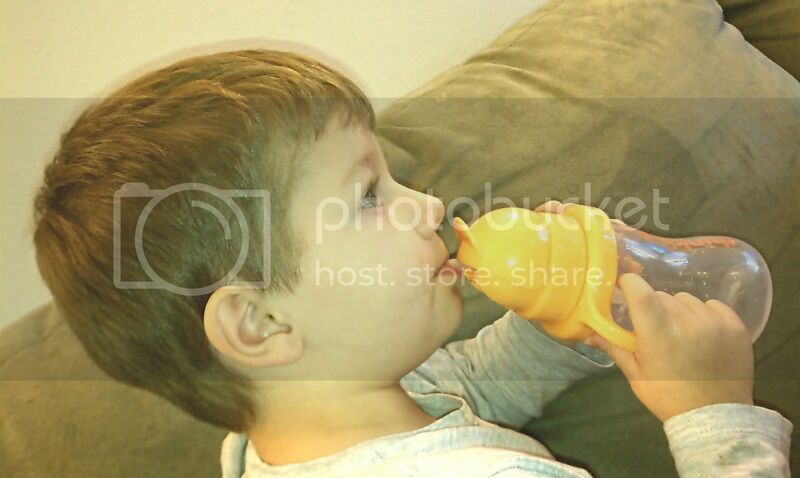 My 4 year old son and my 19 month old daughter both see the Thinkster Straw Sippy Cup as the best cup in the house. We will definitely be getting another Thinkster so that they can each have their own! They like the Thinkster Straw Bottle because it has a cool flip top and a straw, which automatically means that it is cool. The handles are easy to hold for both of them as well.On occasion, they will forget that it's a straw, and will try to tip the cup bottoms up to get the last bit of water out. There are no spills(! ), but that can be frustrating for them before we notice and can give them a reminder. I love the Thinkster straw sippy cup because it is BPA-free, and contains no phthalates, nitrosamines, PVC, lead, or harmful chemicals! It is great to have a plastic cup that we can use in carpeted areas and in the car--and not have to worry about spills or dangerous chemicals. In addition, the Thinkster is dishwasher safe! (Top rack recommended.) The Thinkster bottle is actually the same bottle as the thinkbaby bottle and sippy cup and you can buy a conversion kit to turn your bottles or sippys into the Thinkster with the straw. That's a great way to save money! The Thinkster has a great flip top design which tucks the straw down and protects from spills and protects the straw from germs. I did some spill tests: holding the cup upside down produces no spills, although shaking the cup right after someone has been drinking will spray out the contents of the upper straw only. This is actually much better than I had imagined, as the upper straw portion is only about an inch long, so there is not much liquid in there to be splattered. For me, it's also a trade that is worth it over regular sippy cups that have valves, which I find are too hard for young children to use. I really love the flip top and the fact that the straw can be disassembled for cleaning. Although, when filling the Thinkster, be careful not to lift the cup by the handles, as they are not actually attached to the bottle/cup portion unless the lid is on. I found that the Thinkster was easy to clean by hand and in the dishwasher. We even did the ultimate sippy cup test and left juice in there overnight and milk in there for two days unrefrigerated. (Of course we did that on purpose and in the name of science...both times.) Both times the juice and milk sludge cleaned out easily and the Thinkster retained no smell after being washed! I was incredibly impressed! We've also been loving the Thinksport Livestrong Sunscreen because it is natural and safe for families and children. The Livestrong sunscreen is free of harmful chemicals and known carcinogens, is not chemical based, and is paraben- and PABA-free. Its benefits include broad-spectrum UVA and UVB protection with Zinc Oxide. This sunscreen is produced in the USA of organic ingredients! In testing, the Livestrong Sunscreen has been determined to be "very water resistant," which is the highest level of water resistance as determined by the FDA and means that the sunscreen is effective for 80 minutes in the water. The improved Livestrong formula is designed to rub in and absorb quickly (even with its high zinc content). Purchasing this sunscreen not only helps you fight cancer for yourself and your family, but purchase of the Livestrong sunscreen guarantees that a minimum of $1.5 million will be donated to fight against cancer. Because Livestrong sunscreen is a physical or mineral sunscreen, it creates a physical barrier on top of the skin to protect from the sun. It is not absorbed into the body and bloodstream the way that chemical sunscreens are. This makes Livestrong sunscreen safe for anyone over 6 months, including pregnant women and those with sensitive skin. In addition, mineral sunscreens are effective immediatly upon application, meaning you do not need to apply the sunscreen 30 minutes in advance like more other sunscreens. This feature is really important to me because I struggle to get my kids sunscreened before we head out the door and I usually end up sunscreening them outside anyway. It's nice to know that with the Livestrong sunscreen this won't cause them any skin damage or risk a sunburn. As I've noted before, my daughter adores sunscreen and was a very willing tester for the Livestrong sunscreen. We had fun rubbing it in, and while it does look a little whiter than regular sunscreens, it did seem to rub in more quickly than other zinc sunscreens. 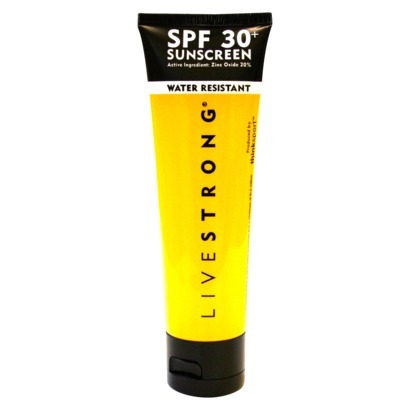 The smell of the Livestrong sunscreen is nice and light and is really hardly noticeable. We liked how the cream feels smooth and not grainy or greasy. It really is a high quality product and you can feel that as you apply it! We applied it before a trip to the park and were protected from the sun and from skin damage. We are so happy to be naturally protected from the sun this fall and winter! 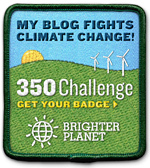 Thanks for reading my thinkster review and my LIVESTRONG review! Remember, you can enter to win a thinkster cup and Livestrong sunscreen now through 11/15/12 here at Why We Love Green!